Despite being unwell and having had to wait all night before finally taking the stage at about 8.00am on a damp Monday morning, Jimi plays at the top of his form, putting in a tremendous performance, as do Billy Cox on bass and Mitch Mitchell on drums. The sound is filled-out by Larry Lee on guitar and Juma Sultan and Jerry Velez on congas and other percussion instruments. Not that Jimi and Mitch ever really needed such assistance; Noel Redding had left the band a couple of months before and Jimi was into making it more of a collective. Songs played include Red House (new out in the States at the time), Voodoo Child (Slight Return), Purple Haze and Jimi’s famously and of course deliberately murdered Star Spangled Banner, his Vietnam equivalent of Picasso’s Spanish Civil War painting Guernica. Izabella, Fire, Hear my Train a Comin’ and Villanova Junction are pretty good too, not to mention the various improvisations and jams. The recording carries some extraneous noise, some unintended feedback, the odd buzz and squeak, but even before factoring-in the primitive equipment and the appalling weather and other conditions of the festival weekend it ain’t bad. In fact, all things considered, it’s really good. The atmosphere comes over and by the time we get to announcer Chip Monck’s closing remarks – closing the whole festival – it’s impossible to feel anything other than downright nostalgic. There is a nice exchange too between Jimi and a guy who comes onstage to fix the mikes. Jimi empathizes with his embarrassment, “I know what you mean. People are looking at me too, man”. There is, however, a loss of authenticity; the tracks have been re-ordered. First off was actually Voodoo Child (Slight Return), not Fire, though Jimi often did open live shows with Fire. As re-ordered, the show plays well enough, with no noticeable gaps or breaks between sections. Some material was left off too, including an encore that started as Valleys of Neptune but ended as Hey Joe. Live at Woodstock has the whole set but for a couple of songs from Larry Lee (but again re-ordered). The booklet with this CD is colourful and informative. A long essay by Michael Fairchild pushes the limits of how much we really want to know about the weather in Mississippi over the Woodstock Weekend (even worse than in Bethel, N.Y., where the festival was held), but on the detail of what it was like wallowing in the mud of Max Yasgur’s dairy farm Fairchild stops way short of the Woodstock film. For that, most buyers of this album will be grateful. Only Alan Douglas could screw up what is probably Jimi’s most well known performance. Deciding that hey, people didn’t need to hear the whole concert, and that he didn’t particularly like the order in which Jimi played the songs he did, Alan in his infinite wisdom decided to give us about half of the concert, and re-arranged the rest for us. Nice guy huh? C’mon, I know most Hendrix fans would have paid for a double CD. This concert deserved a double CD. And as for any arguments about the tapes not being available for the rest of the performance? Well, there was at least tape of one more song, Message To Love, because it’s played during the introduction on the video! And the rest, if not “in the can” could have been taken from ROIO’s and cleaned up. There was no excuse for this Alan, none! Now, having vented, lets talk about what *is* on this CD. Good music. For a band that had been rehearsing together for only a couple weeks, they sound pretty good to me. What everybody would expect from this, The Star Spangled Banner, is here in all it’s glory, although it sounds like crowd noise has been added to it. Which, considering who was in charge of this, wouldn’t surprise me. At least it’s a different crowd this time, previous releases of this Star Spangled Banner on The Ultimate Experience and Essential Jimi Hendrix had the crowd noise from the Atlanta concert added! (listen for tell tale drum thumps(?) during the first few bars) Voodoo Child has a few bars of Stepping Stone thrown into it by Jimi during a jam at the end of it. A rocking version of Purple Haze, followed by an extended Hendrix solo, which leads into the cool Villanova Junction to end this CD (Alan, didn’t Hey Joe close the concert? Hmmm??). This is one that you need to add to your collection, I just wish I could say it’s the one that *should* be there. Perhaps a new version could be coaxed out of the current estate. Like most products issued from the Jimi Hendrix archive in the ’90s, several separate releases featuring identical recordings of this one performance have been issued. 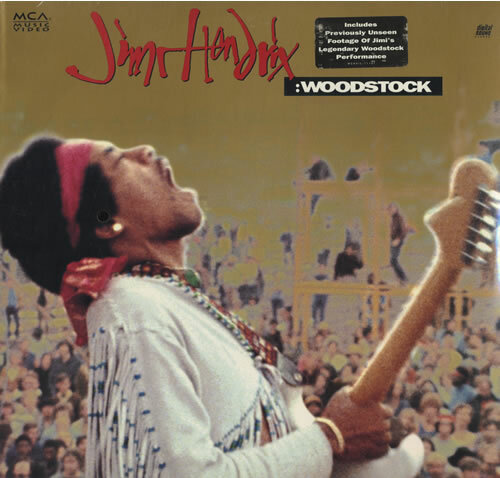 1994’s Jimi Hendrix: Woodstock on MCA is the first formal packaging of this most famous of rock shows. Other, more collectable discs followed, often with much more extensive track lists. The Woodstock show that these discs commemorate was supposed to be a headline performance for Hendrix and his band, but after many delays and a fan exodus, the guitarist ended up playing to only a fraction of listeners a full day after the event was scheduled to end. The first performance with new backing outfit Hendrix’s Gypsy Sun & Rainbows, this expanded outfit is often difficult to hear over Hendrix and his guitar on this recording. Although very significant, this isn’t one of Hendrix’s best recorded performances. Relatively pedestrian versions of hits like “Purple Haze” and “Fire” are included. The redefinition of “The Star Spangled Banner” is still considered one of the most chilling rock performances ever, and funky jams like “Hear My Train a Comin'” are also very impressive. Fans might want to consider later releases of this performance that include more material, but one way or another, all devoted scholars of the greatest musician to ever plug in a Stratocaster should own at least one packaging of this performance.